The UEFA Champions Festival in Roald Dahl Plass in Cardiff Bay. Cardiff is a flat and compact City with the major attractions within easy walking distance from the city centre and the Festival. Stay up to date - For the latest travel advice and information, follow us on Twitter @cardiff17travel and download the handy Travel Guide App. The spectator guide is available to download in English, Italian, Spanish and Welsh. Please note: As per previous Finals the Festival will not be screening the match on Saturday 3 June. The Festival will be full of excited football fans in the City for the UEFA Women's Champions League Final on Thursday 1 June and UEFA Champions League on Saturday 3 June, and we hope you all have a great day. If however you do not have a ticket for the match that day why not go along on one of the other days to ensure you don’t miss any of the many attractions including having your photo taken with the Trophy on Thursday 1 and Friday 2 June. As a compact City, Cardiff will be a great place to walk around during the Event. 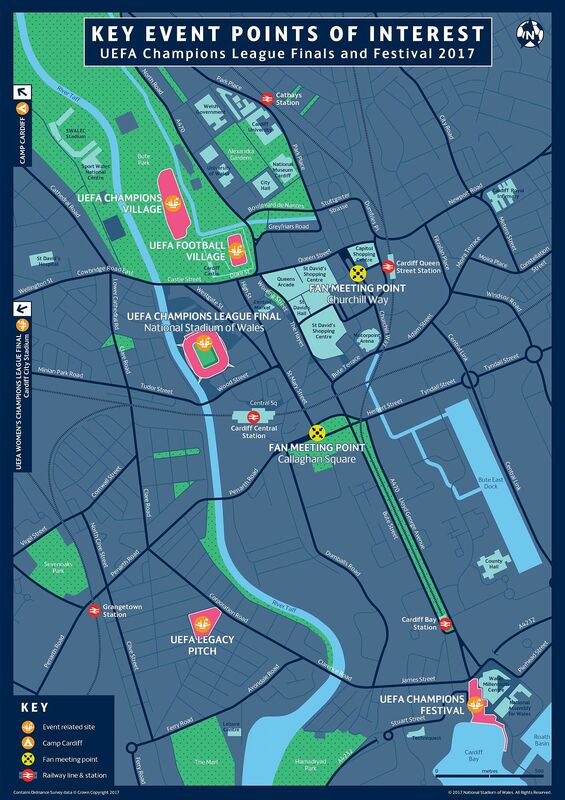 The UEFA Champions Festival at Cardiff Bay is an easy walk from key points in the City Centre including the National Stadium of Wales, Cardiff City Stadium, Fan Meeting Points and Cardiff’s central rail stations. There will be volunteers (known as Champions) on the dedicated walking routes between key points across the City to help direct you to where you want to go. Also have a look at the key points of interest at the bottom of the page. Cycling will be a great way to get about during the Event. However please be aware there are expected to be 170,000 people in the centre of Cardiff on Saturday 3 June which may make cycling more difficult on that day. A number of coach operators run services to Cardiff. This includes National Express which offer services into Cardiff from all major cities including London, Birmingham, Bristol, Manchester and Swansea. Private chartered coaches are encouraged to pre-book a parking space to ensure there is no disappointment on the day!! Alternatively download the Travel Guide App for information, options and advice on travel and accommodation for the Finals and Festival. Cardiff Bay Rail Station is the closest to the Festival. This a small station and so catching the train to Cardiff Central Station or Cardiff Queen Street Station and then walking is strongly advised particularly on the evenings of Thursday 1 and Friday 2 June. Cardiff Central and Cardiff Queen Street Stations will also be busier than usual so allow extra time for getting to the Festival particularly on Saturday 3 June. Rail tickets can be booked here. Please check your return journey options before booking your tickets. You can plan your travel by downloading the Travel Guide App. Cardiff is accessible via the M4 motorway, which runs from London to South Wales. The Second Severn Crossing, which takes vehicles over the River Severn on the M4 motorway, is a toll crossing for which a fee is payable. Please note parking is limited and you are advised to use Llanwern Park & Ride (3 June) and Cardiff Bay (South) Park & Walk (1-4 June). The spaces can be booked in advance. Please do so now. Remember to switch off your SatNav as you approach the City and follow the road signs for the best route to the dedicated Park & Walk site. There is accessible parking at the Cardiff Bay (South) Park & Walk site. Please book your parking in advance here to ensure you have a space. If you are travelling by other public transport please check arrangements with the individual transport operator.